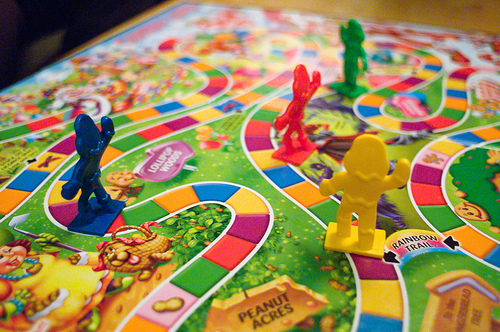 I have played numerous hours of Candyland, one of the most boring games in the world. It started when I was a teenage babysitter and one little boy made me play every time I came over. Then I had children of my own and of course someone gave Oldest Girl Candyland and she loved it. So I've gritted my teeth and played more than my share of Candyland. One day, when Oldest Girl was two we dropped the Professor off at work. The baby needed to nurse before the drive home so we sat there in the car and Oldest Girl looked out the window at all the people in business attire heading into the tall building. "Are all these daddies going to work with Daddy?" she asked (never mind the fact that many of the "daddies" were women). "What do they do at work?" Hmmm, how to explain that at a 2 year old level. Time for the old standby. Answer a question with a question. "What do you think they do?" She thought for a moment. (One of the things I love about Oldest girl is that she always thinks for a moment, much like her dad and unlike her mom). "I know," she said with excitement. "They play Candyland." The thing is, that isn't such a bad description after all. Some days at work are like Candyland from my perspective: boring, repetitive, advancement seems to be just a game of luck. Some days are just about turning over the cards to see what your lot is, and some days you are stuck in the molasses swamp. But some days... Some days at work are like Candyland from Oldest Girl's perspective: exciting, fun, full of all the colors of the rainbow, and delicious treats. Some days are looking forward to turning over the cards because it just might be a double color card or even better it might be Queen Frostine and you get to leap ahead of all your competitors and the end is in sight and winning in your grasp. The trick, it would seem, is choosing a job where more days are like Oldest Girl's Candyland. But the secret is deeper than that. The trick is choosing to view whatever job you are in like a 2 year old views Candyland: comfortingly familiar yet full of exciting new possibilities each day.